LURE Restaurant menu: 7 days per week, Breakfast 6:30am - 11:00am; Sunday thru Thursday Lunch and Dinner 11:00am - 10:00pm, bar open until 11:00pm. Friday and Satrday 11:00am - 11:00pm, bar open until 12:00am. Free underground parking for LURE Restaurant patrons. Lure is pleased to offer group bookings for up to 50 people. Completely re-launched in June 2014, the new LURE Restaurant and Bar is casual, comfortable, and familiar with a new menu, cool cocktails, and amazing views! LURE Restaurant & Bar is the place to be in Victoria. We offer a prime waterfront location with Victoria’s hottest patio. Chef Dan Bain creates amazing local bites and the bar serves up the Island’s best cocktails, wines by the glass, and local brews on tap. Come any time! Breakfast, lunch, dinner or after work. Drinks, small plates or a full meal, Happy Hour 3-5 PM daily, we have it covered - not to mention the best views of Victoria in Victoria! 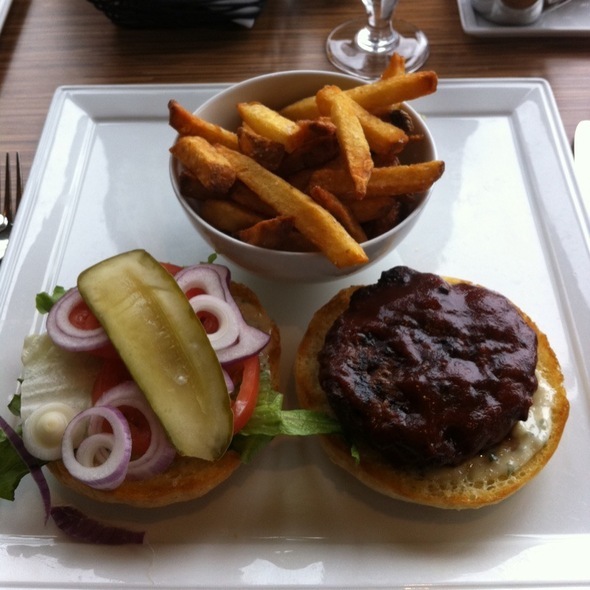 LURE Restaurant and Bar is located at the Delta Victoria Ocean Pointe Resort and Spa, an easy 5 minute walk over the Johnson Street "white bridge" from Victoria's downtown centre. 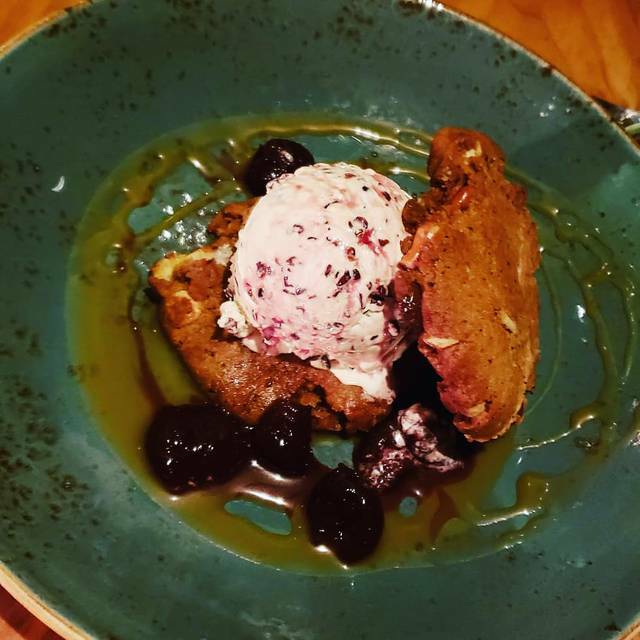 Brown butter + cocoa nib ice cream, kitchen sink cookies, whisky caramel sauce + sweet pickled cherries. Great for sharing! Pull-a-part sweet bread, espresso Kahlua-chocolate dip, marshmallow brulee. Great for sharing! a type of chocolate ice-cream. Not a good taste combination. Left half in the dish. Great venue with a magnificent view. Drinks, food and service are all superb! I reserved for a business lunch. was hoping for the patio, but that didn't work out, so we had a table near a window, which was ok. food was good, price fair, and the service we received was simply outstanding. thankyou Timothy! You cannot beat the beautiful view at Lure - especially patio drinks on a sunny day. The drinks were great, the food was just okay -given the higher price point it could be better (flatbread was bland, salad lacked dressing). Our server was amazing. I wish I had remembered his name. We had a very pleasant and enjoyable dinner experience. There were five of us and he was attentive to all. My family was from out-of-town and were totally impressed. The food was fine, but could be better. There was a large group in another section (about 20 people), and this may have impacted service as it was very slow. 6:30 reservation for four people, we left at 9:00pm, simply due to slow service. But I would certainly give them another chance the next time I stay at that hotel, as it is very convenient. Food good, view great, but extremely noisy and it took 45 minutes plus three reminders about drinks not arriving and food. Slow service! Good food and great views! 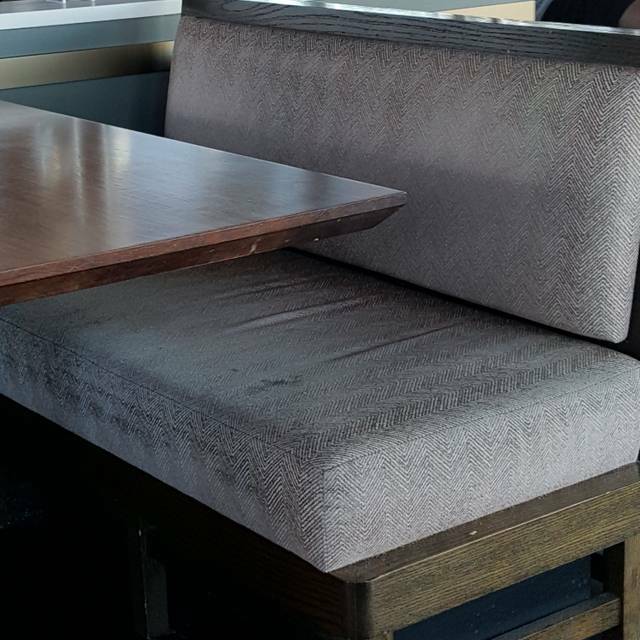 Seating in the booths was cramped and tables are quite close together but overall noise levels were reasonable. Very polite and helpful staff. Overall a positive experience. We'll come back again. Was there for a business meeting an ordered a bunch of appetizers. The amazing: pork belly, pulled pork flat bread, maple bourbon ribs, house made chips, yam fries. The Good: lamb meatballs. The bad: chicken wings. Lure is a great restaurant with great staff and a perfect location. I recommend you try it if you haven't. Another great meal. They accommodated our small group for a birthday party, presented us with wonderful meals, timely service and a lovely location. Can't ask for more! Great location - Great food choices and vegetarian choice as well! Beautiful views and excellent service! We have been going to Lure for Valentine's for years but we were disappointed they didn't have their typical Valentine's dinner this year and the pop music on the PA didn't go with the night's theme. Table location by the entry was also disappointing. Service was great though and food was very good. Would recommend for dinner, but likely won't be back for Feb 14th. Menu wasn’t special for dine around. Servers weren’t very friendly. Food was small portions. There was an event going on and so understandably very busy. Service was noticeably slower. Both the maître de and waiter communicated very well and did above and beyond service to ensure we were looked after. Thanks guys (Matthew and Jeff) for your amazing service and attention to details. This place has one of the best views in the city. They are following the trend of open space and noisy facility which is not as enjoyable. Overall you really can’t beat Lure. Hard to beat the setting for a family brunch gathering. Nice offerings. Well made. Decent value for sure. Food was good but had been sitting a while before we got it. Service pleasant, but very slow and inattentive. Water not brought to the table. No bread with meal. Seating not very comfortable; ambiance noisy. Overpriced for food and beverage; service; comfort; ambiance. We will not return. Great appy’s. Average mains Very uninspired menu choices. Probably a good spot for beer and burgers on the patio in the summer. Restaurant I believe was understaffed, the waiter we did have was very personable. was delivered as requested. requested again then finally asked bus person. Food was good served quickly, but again waited for coffee far too long ( ordered 2x) and the POF machine . Went to front desk to pay bill. I don't blame the staff as I think more wait staff should have been working. if you add avacado ensure it is on the side as it cools the eggs benny! Always enjoy Lure. Staff were friendly and appropriately attentive. Food was great and of course the view is outstanding. Highly recommend. Went with friends for dinner on a Saturday evening. We had a very nice window seat looking out over the Inner Harbour. We ordered several tapas and shared everything. The brussel sprouts and charcuterie board were excellent. Service was excellent. Our server was friendly and checked in with us periodically. We would definitely eat here again. They happily accommodated our large party of 14 (though only 11 made it). Hostess Amalia and our server Yuki treated us very well! Have to try the lamb meatballs of course and the seafood chowder was "comfortingly" delicious. The risotto with added prawns was perfect. And as wonderful as this place is-- the view of Victoria's night lights from Lure is unbeatable! Almost forgot to mention the upbeat bar with the trio of bar tenders led by Jack -- the Lure specialty bar menu is outstanding. It’s a good restaurant, the view is incredible and the service is excellent. The food itself I found a bit lackluster. The ordered two different fish dishes (both is the $24-30 range) and one was overly salty and the other was on the bland side. The value was ok but not great, though in line with downtown restaurants. I would recommend more menu options as we found it a bit lacking. Overall a good experience. Food was average at best and over priced. Disappointed given the beautiful location. Would not recommend. Service was great and food was tasty. The menu is much more casual dining than it had been in the past. The seafood offerings were rather limited. Great venue to have a tasty lunch. Quiet atmosphere. Locally sourced food. Good over all place with friendly service and great views. Our server was excellent. I'm sorry I didn't catch her name. Our food was fantastic but unfortunately the service was pretty terrible. We waited at the door (not greeted as we came in) for a long time before anyone even acknowledged our presence. Finally we were greeted by someone who was not overly friendly. When we were eventually seated we did not have a server for a while and it was only when the manager came over to help us that we received great service. He was very nice, informative, and helpful. The food was amazing too, but overall we would have liked better service and to have been treated like we were valued customers instead of a nuisance by all the staff (except the manager). Not worth the money for this visit. This is one of my favourite venues for the incredible view of the harbour. The food is reliably good, although the bruschetta was soggy yesterday. The staff are condistently pleasant and have frequently gone to some lengths to make our time there worthwhile. The only ongoing annoyance is that the music is very loud and invasive, making it difficult to hold a conversation. Yesterday was the first time the noise level was tolerable. It was also the first time we'd sat in the outer balcony area, so that might have made a difference. I have frequently implored the staff to lower the volume and I know I'm not the only patron to request that. We are always told it cannot be lowered by more than a tiny amount. It might behoove you to listen to your patrons, especially the elders, as it is honestly quite off-putting to dine with people when assaulted by overly loud music. We and others would make your venue out #1 dining and hosting destination if not for that one deterrant. My friend was delighted by her first time in the Lure restaurant. We shall return. I have recommended your restaurant to countless people, who are always glad they went, apart from the loud music. Very nice dinner and service was impeccable. This is a beautiful spot with modern decor and a live DJ on weekends. It’s got a great view of the inner harbour. We had a great table right near the windows. They’ve got a fantastic appetizer selection and we actually opted just to share some appies - so delicious! They also had an awesome drink special on - old fashions for $6! It’s also very reasonably priced. Highly recommend!